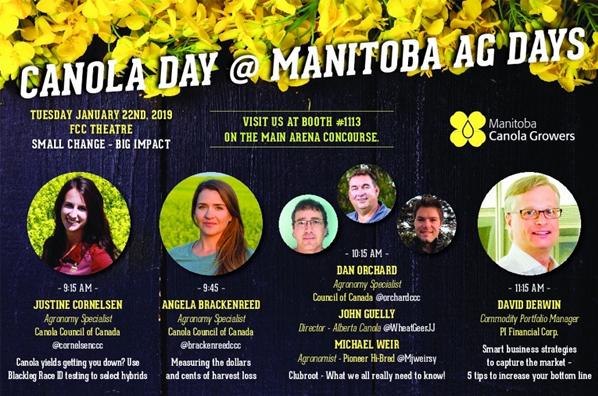 Join us on the Tuesday morning of Manitoba Ag Days for Canola Day. Blackleg continues to be one of the ‘big three’ plant diseases to rob yield from Canadian canola crops. The NEW blackleg race test is an additional tool to use with best management practices (BMPs) for the disease. Find out how to properly use blackleg race ID information and why resistant varieties need agronomic support. Join me to find out what the number one yield robber is in Western Canada. What is the economic impact of canola harvest losses to your farm? To all of Western Canada? We will discuss how to measure, quantify, and reduce these losses for better yields and economic returns. 10:15 AM Clubroot – what we all really need to know! David Derwin, Commodity Portfolio Manager, PI Financial Corp.